Finland's Jessica Huot and Juha Valkama are the first dance team from Finland since Susanna Rahkamo and Petri Kokko to compete seriously at the international level. Finland’s Jessica Huot and Juha Valkama are the first dance team from Finland since Susanna Rahkamo and Petri Kokko to compete seriously at the international level. 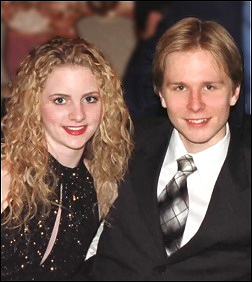 The duo won the Finnish junior dance title in their first season together, then followed with another junior title and the senior title in 2002. They finished 27th and 20th in their two Junior World Championships, 21st at the 2002 Europeans and 26th at the 2002 World Championships. Both skaters like the challenge that skating presents and enjoy competing internationally and seeing lots of different places in the world. We want to have fun and see how far we can get,” Huot stated. Huot was seven when she started skating. “I started to skate because while I was at a friend’s house my friend’s mother took us to a store to buy skates for her so she could take Learn to Skate lessons,” Huot stated. “My friend’s mother called my mom to say that we were going to the store and my mom said to have me fitted for skates so that if I wanted to try we could go back to the store to buy me the skates. My mom and I went back to the store and bought the skates and I went to Learn to Skate classes with my friend.” Valkama didn’t begin until he was nine, switching to dance when he was 14 because his knees couldn’t take the impact of repeated jumps. Huot and Valkama became partners in 1999 after she split with her former partner. After calling all over the United States to find a boy without a partner, her mother finally heard that Natalia Linitchuk had a boy from Finland. A tryout went well as the two had similar skating styles so Huot moved to Delaware with her mother to train with Valkama. Last season, they were coached by Linitchuk, Gennadi Karpanossov and Gary Irving at the University of Delaware, where they trained for three to four hours a day on ice with another hour in off ice activities such as weight training and dance classes, including ballet. This summer, they relocated to Massachusetts, where Huot’s parents live to begin preparing for college in the fall. They are training in Newington, Connecticut with Tatiana Tarasova’s camp with Nikolai Morozov and Maia Usova as coaches. For the fall, they are investigating training facilities in Boston, expecting to work with Dimitri Kazarlyga as their coach. Linitchuk and Vitali Popkov choreographed the couple’s programs, which included Chopin’s “Fantasie Impromptu” for their free dance last season. They expect to keep the same music for this season but modify the moves. “Juha and I both like classical style dancing the best,” Huot said. “We listen to our coaches suggestions for music and make some of our own suggestions and our coach narrows it down to the final decision.” Both skaters are musically inclined. Valkama plays the guitar and Huot plays the piano.